Before the season began, Honda had goals for the very bad engine it makes for the McLaren-Honda Formula One team. But Honda couldn’t keep the engine working long enough to meet them, and when it did work, it didn’t work well. But, rejoice! After 11 races, Honda finally met its pre-season performance goals. It feels like Honda F1 head Yusuke Hasegawa has spent most of his time this season reassuring everyone that Honda will, in fact, someday produce an engine that functions well. Just check here, here and here, if you need an example of how to stay positive while the entire world is burning down around you. You never know when you may need that, you know. 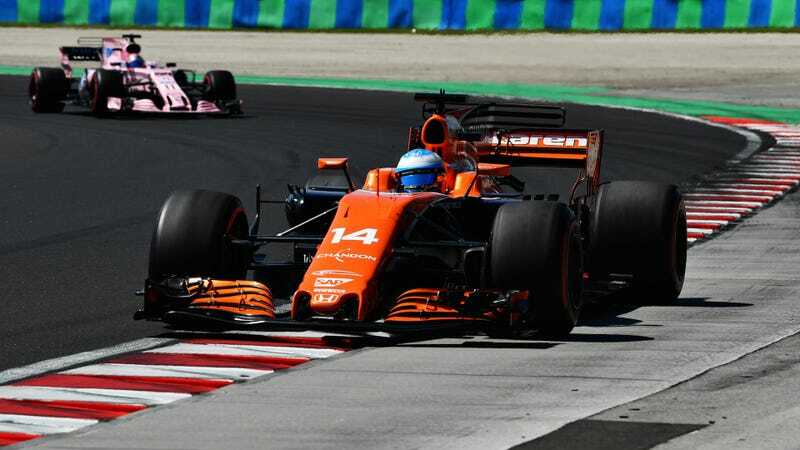 But now that both McLaren-Honda drivers have actually stayed in a race long enough to finish within the top 10 and score at least a point, the team will end the season with slightly more than a goose egg by its name in the constructor standings. (Things weren’t looking good on that front for a quite while.) The team officially has a whopping 11 points, compared to leader Mercedes’ 357. Driver Fernando Alonso, who ditched the McLaren-Honda F1 team during the most visible race of the year to run the Indianapolis 500, even set the fastest lap of the Hungarian Grand Prix. It was a joyous time. Hasegawa said Honda shouldn’t have started so far behind its rivals at the beginning of the season, but told Racer he’s proud of the progress it’s made through the first 11 races. Honda is still far behind its rivals. There’s always next year, if McLaren keeps you around, Hasegawa. If there’s something else positive to say, just about anything—even Honda’s prospect of staying at McLaren—is likely to last longer than the engine itself. Plus, while on its unstoppable success streak earlier this week, Honda set a goal to become only the second-worst engine supplier in F1 ahead of Renault. Give ‘em five months. Or maybe 10.